Edge-Class Cabin Information Compilation - PLEASE - DO NOT POST CABIN QUESTIONS HERE! We did NOT have a rocker in this suite the very next week, Feb 3. Just a regular chair instead. As lsb48154 stated, would book again in heartbeat. Noise Issues? : None, this was a great location. The fact that we entered a hallway to get to our room meant that we were buffered from any hallway noise. 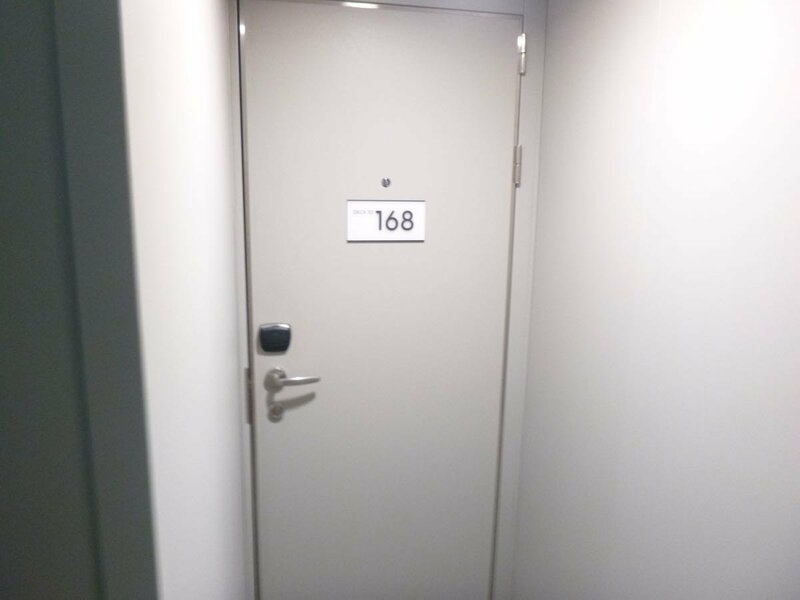 While having to use our keycard twice to get into our room was different the noise buffer and privacy was great. We shared the hallway with a sky suite I believe. Connecting Cabin? Where Does it Connect? : Kind of connects to the sky suite with the hallway. Someone could book both rooms and leave the doors open, outer door would provide the security. Advantages/Problems/Comments: While this was not the largest inside room we have stayed in, it was the nicest. The storage space bordered on ridiculous, I am not sure how anyone could use up all the space. 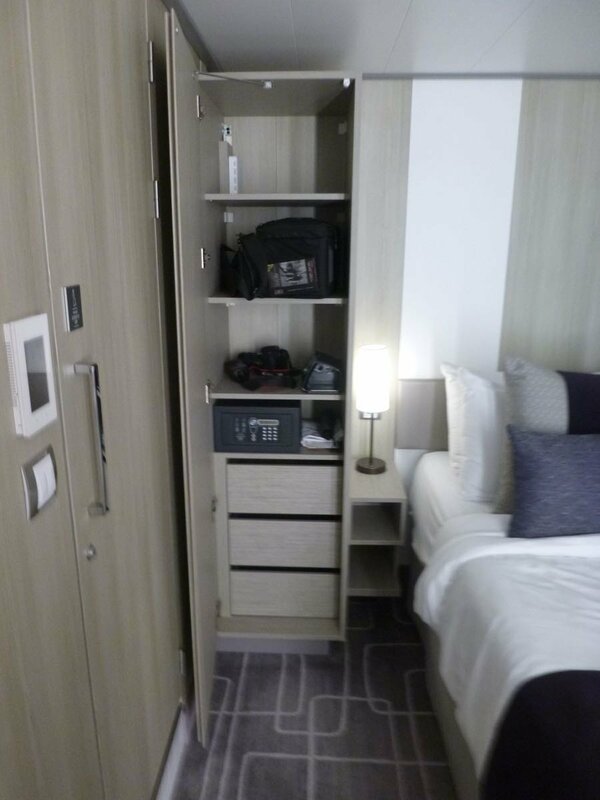 The cabinet by the bed was spacious and the drawers were nice for clothes and there were plenty of hangers to hang up our clothes on. 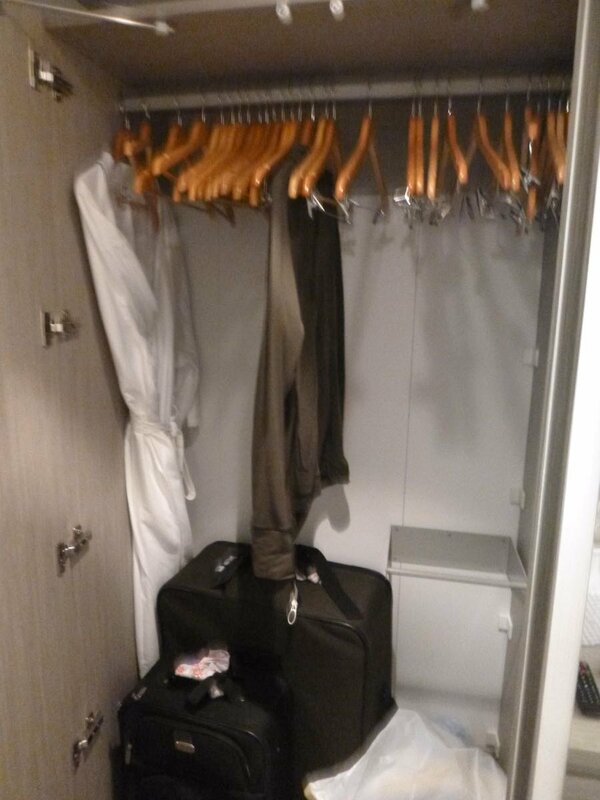 Storage in the bathroom was fine and the hooks on the back of the door were perfect for hanging up our toiletry bag. 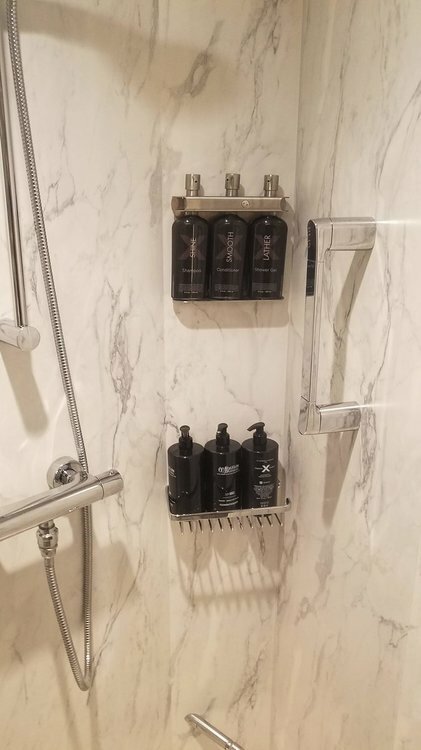 The shower was amazing. Honestly it was larger than what we had in a concierge cabin on Disney. 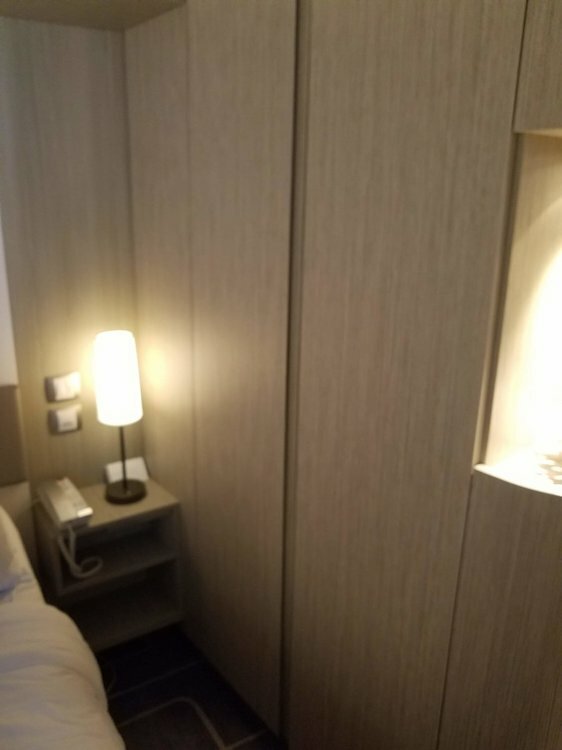 A nice touch was the plug by the bed for the CPAP machine. Only complaint was the lamp wasn’t movable and it was tight to get the CPAP power supply plugged in. 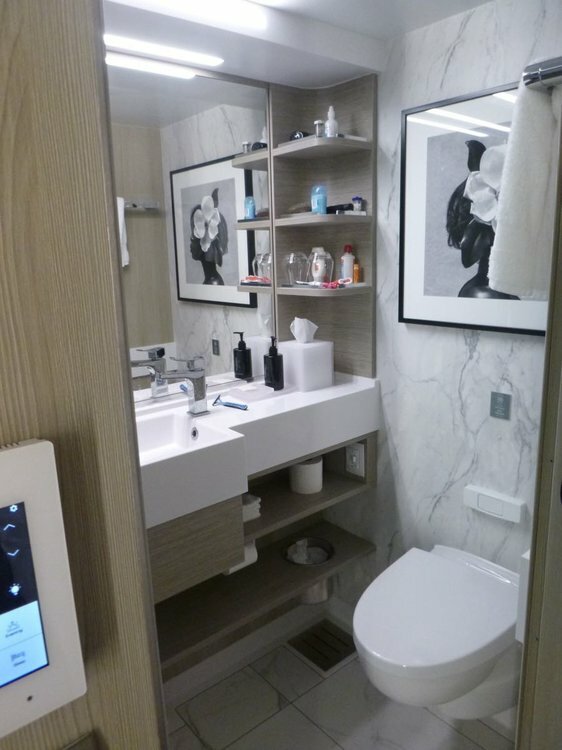 One comment about the bathroom, there is a drawer under the sink, even though it doesn’t look like there is enough space for one. Would You Book It Again? 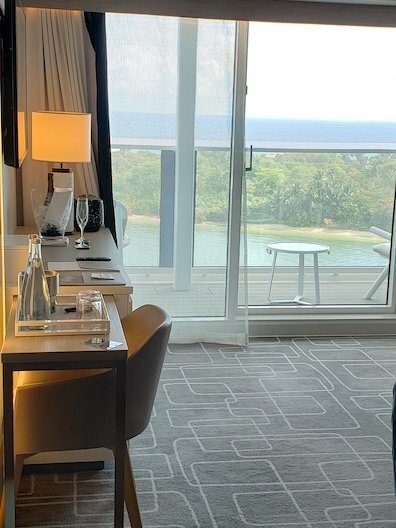 : in a heartbeat, it was a great room on a great ship:) That said we are in an oceanview on the Apex, because the free perks made that room a better deal. Advantages/Problems/Comments: Great cabin. 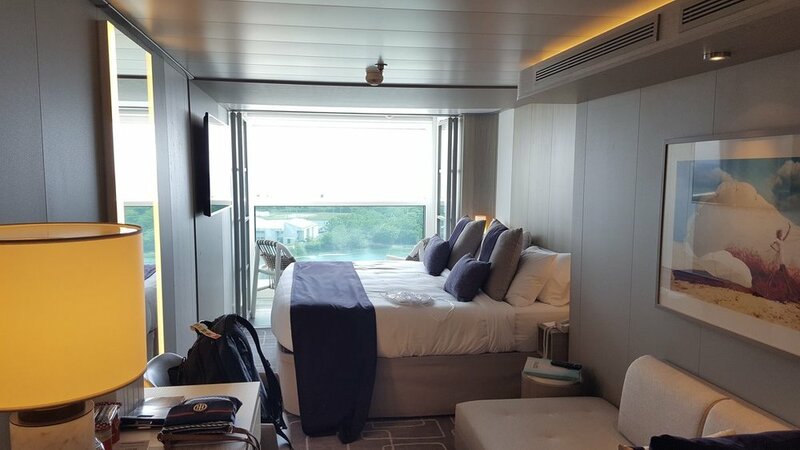 Larger than regular veranda cabin (longer); great balcony. Magic Carpet Issues? : Nothing that bothered us, moved a few times a day which we actually got a kick out of if we were in the room to see it on the move. Teased that if we had longer arms we could grab a bottle off of the bar. Noise Issues? 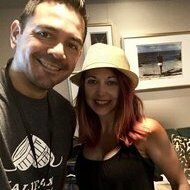 : At least for the 1st half of the cruise, none! After the first night, we actually commented it was the most quiet night we've ever experienced on ANY cruise. No creaks, nothing! And it remained this way. However, during the last 2 or 3 nights, there was a lot of noise in the middle of the night. Banging, clanging, woke us up. On the last night, it was so excessive I think I was awake for close to an hour. If it wasn't the last night and I wasn't so hell bent on getting back to sleep, I would have recorded the noise or called Guest Relations. I did discuss with Joao/Retreat Concierge who said I should have called him to report it but that he would certainly share my report. Suite Details: Really loved this S3. 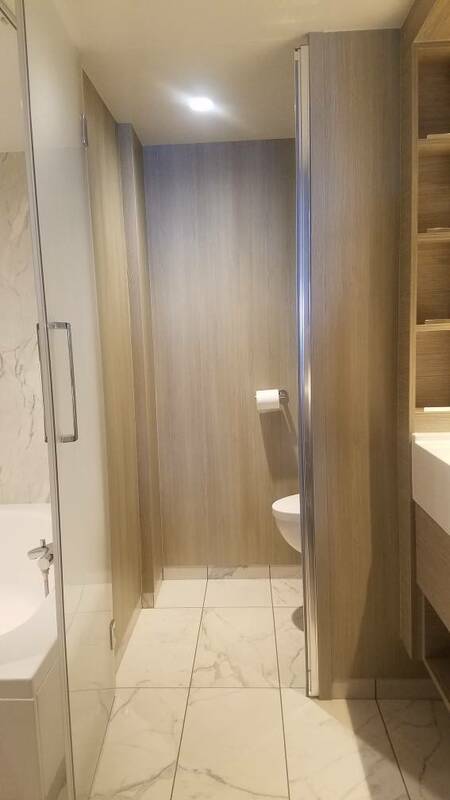 Great location, size of bathroom was great. We were actually offered an upgrade to an S2 that we declined after we saw the suite. 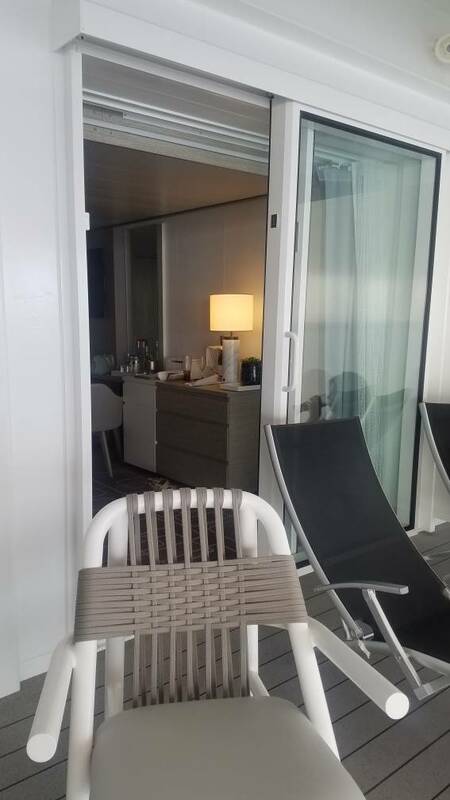 We tend to spend a lot of time on our balcony and were very happy to have 2 loungers in addition to the chairs already on the balcony when we arrived. Photos or Photo Links: Coming soon! Would You Book It Again? 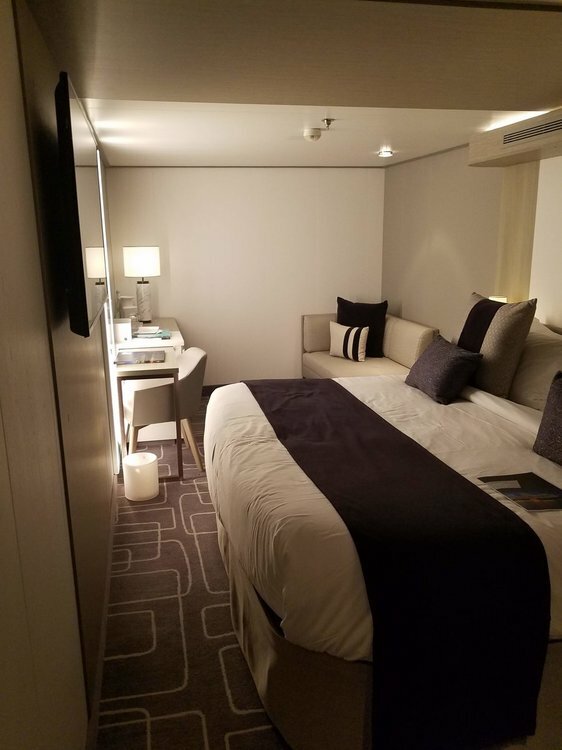 : I would prefer something with a regular balcony, but if I were to book an Infinite Veranda with bed by bath in the future I would book this cabin again. 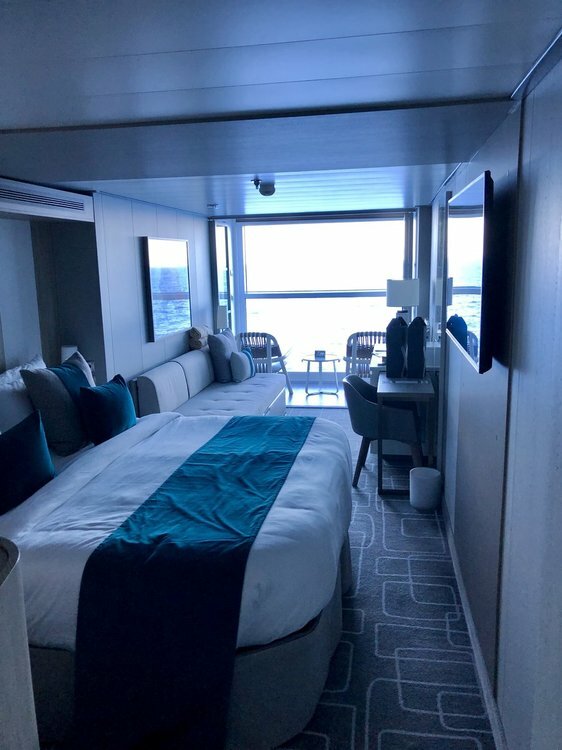 my Pics of various cabin types, including Iconic Suite! Advantages/Problems/Comments: Great size and excellent storage. Location is very convenient to aft elevators. Mattress and couch are very firm. We sporadically experienced a strong pit toilet odor in the bathroom. Noise Issues? : Heard chairs moving only twice; husband noted an occasional rhythmic thump in the morning he thought was related to the running track transferring through the structure - I didn't notice it. Interestingly, with the slight solarium overhang we thought the sound of the water was amplified. We did hear residual pool deck music (bass) and microphone when there were activities on the pool deck, but this wasn't particularly bothersome and was offset by the wave noise. When the IV was closed there was no sound. Wind Issues? : No, and there was fresh air circulating through the verandah when the window was open - it was not stagnant nor was it blustery. 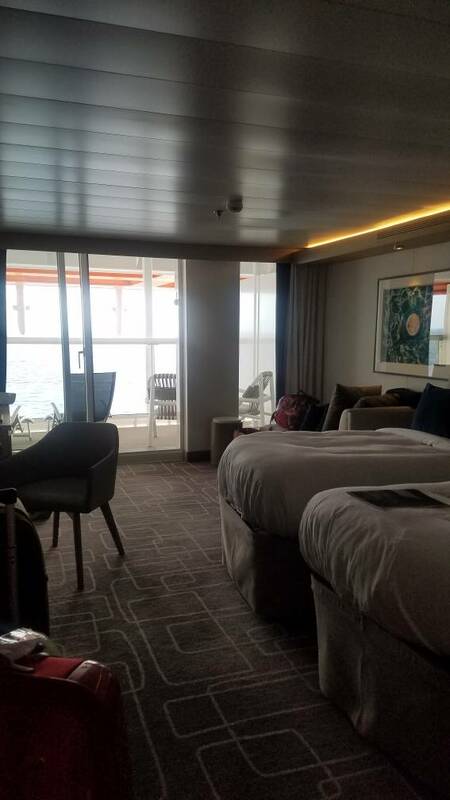 Advantages/Problems/Comments: Loved the location - very convenient to access deck 14 forward for the spa, spa cafe, and the theater and club on decks 4 and 5 forward. We also were pleasantly surprised at how much we appreciated the overhang - when sun was hitting that side of the ship, the verandah may have been too hot and unusable with direct sun and would have made the cabin hot - with the overhang we always had a sun shade while being able to have the window open and enjoy the verandah. We found the bed by the verandah to be convenient for accessing the closet and getting ready for the day and for dinner. This cabin abuts a fire wall, so no sound at all from one side of the cabin. Rarely heard cabin neighbors on other side unless they were on their verandah and we had our verandah window open. Great view looking down to ocean and toward bow. Bed Position: In bedroom, facing front to back. 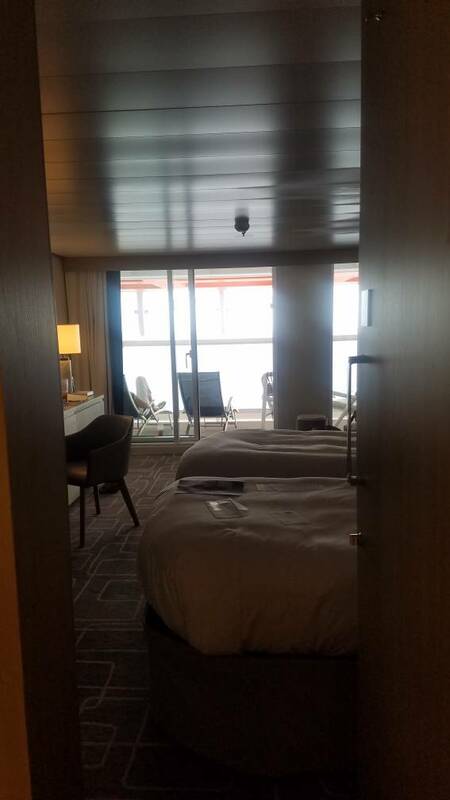 Balcony/Window Size: Two cabins wide with triple window, sliding door in middle. Balcony/Window View/Obstruction: Forward view obstructed by the ship's bridge. But you can look into the bridge! Balcony Overhang? : Covered from above. Shady most of the day. Wind Issues? : When ship is moving, whistling balcony door because it does not latch from the outside. Connecting Cabin? Where Does it Connect? : Non-connecting. 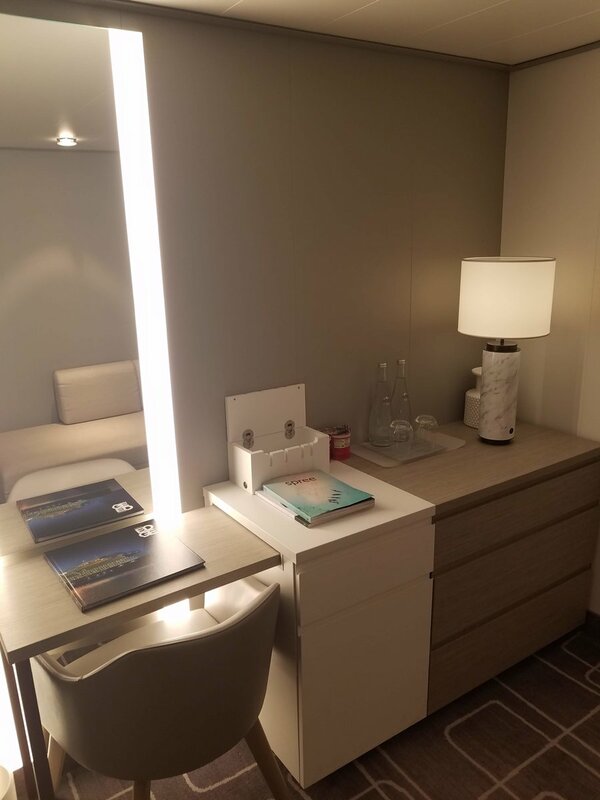 Suite Details: For those thinking about a CS, it is very much like the S-Class CS with the enclosed bedroom. 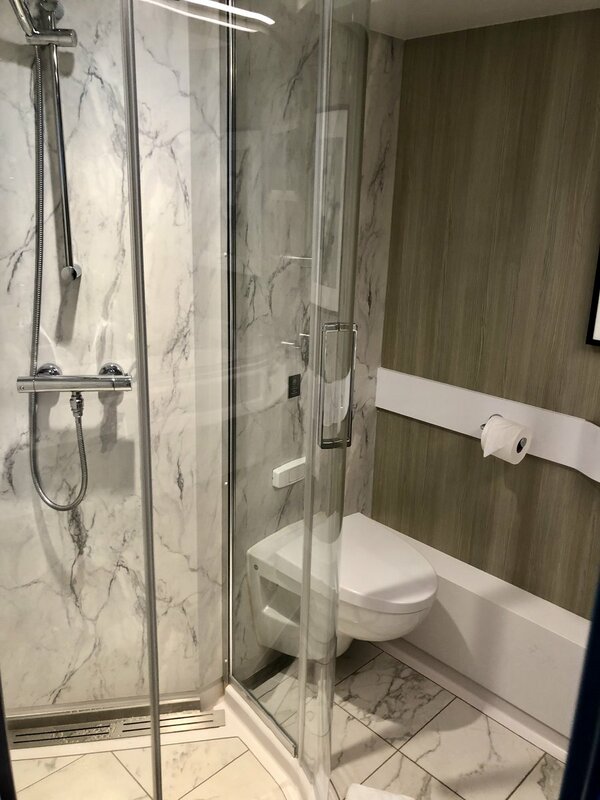 The double bathroom on the Edge CS is very nice. The bedroom is comfortable. Outlets on one side of the bed. Safe in bedroom closet is pretty small. Lots of storage everywhere. Suite colors were gray and white like the rest of Edge but artwork and pillows added a lot of color. Nicely done. The living area is modern but the couch is pretty hard and uncomfortable. Pillows galore! The two sconce-type lamps behind it on the wall are too low and we were constantly banging our heads on them. Great rocker unless they have since removed it. 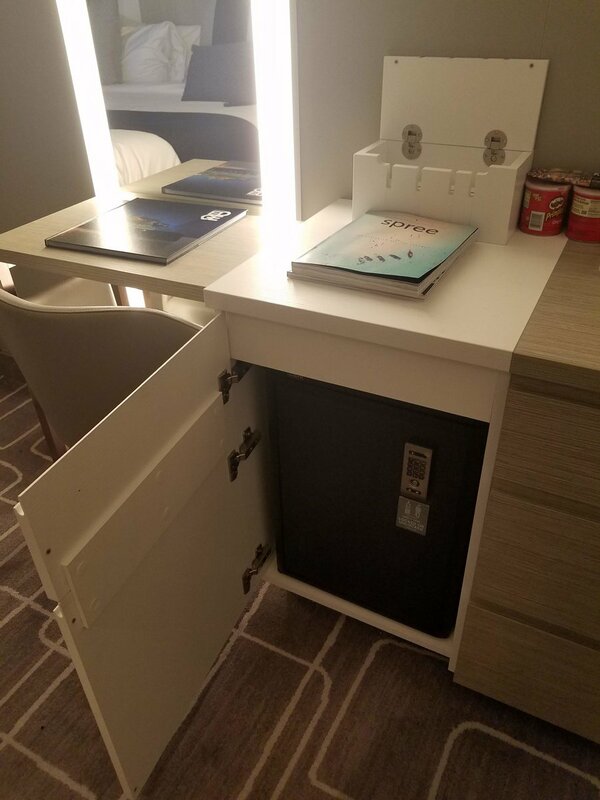 Lighted desk/Make up area is nice. The balcony is wide but not deep. No loungers or foot stools. There is a full size table with two dining chairs, and also two comfortable arm chairs. The electronics panel allowed us to control everything in the suite or by using the app on our phone. Very nice! Service was exceptional by the butler and room steward! 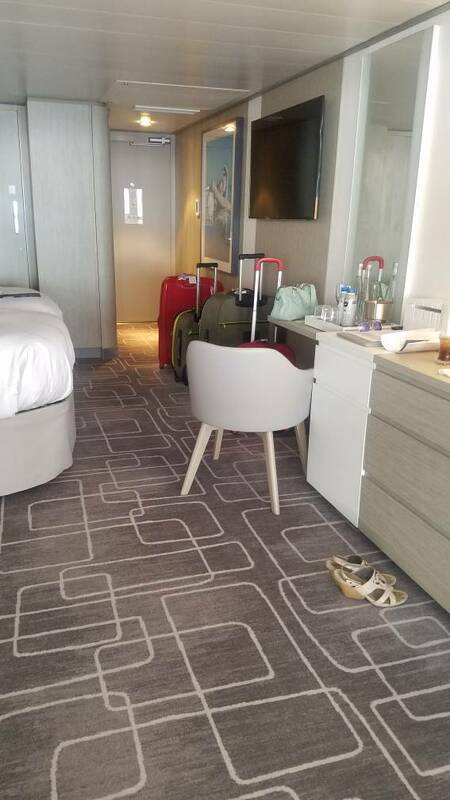 We also used the luggage valet service free to this suite when we checked out. It worked great! 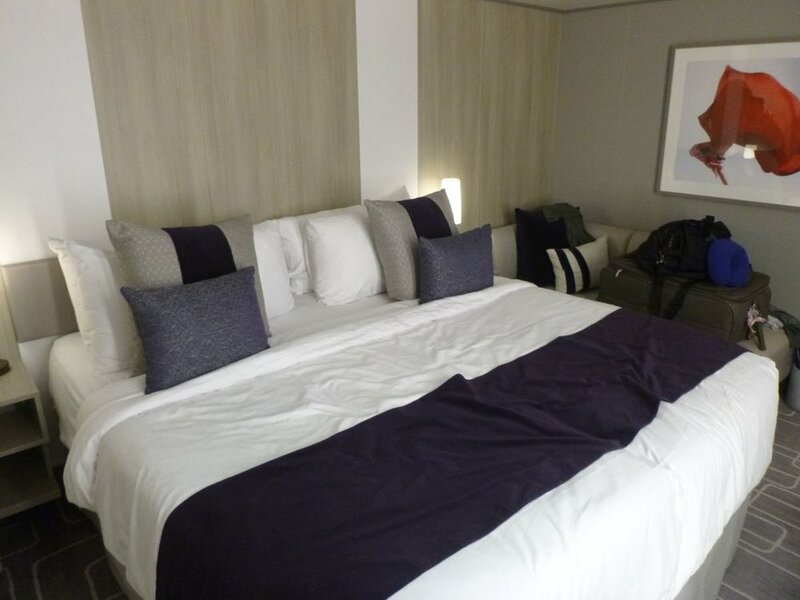 A big advantage of this suite is that it is very close to Luminae, the Retreat Lounge and Retreat Sundeck area. 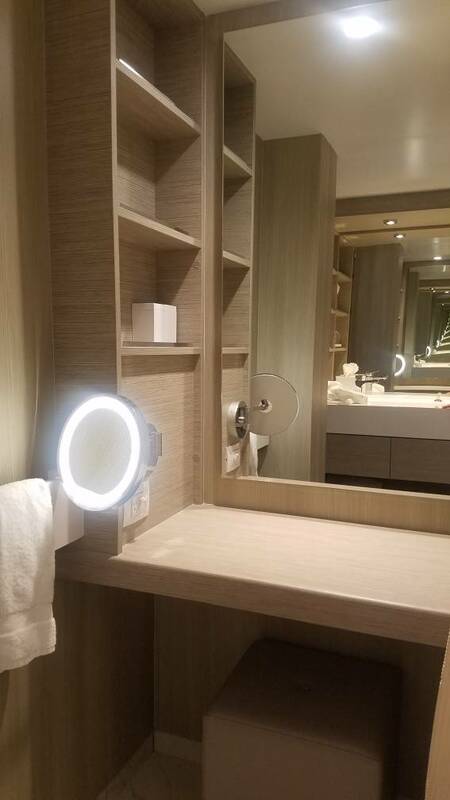 One subtle advantage was that you could leave Luminae, walk across the hall and use your own bathroom! 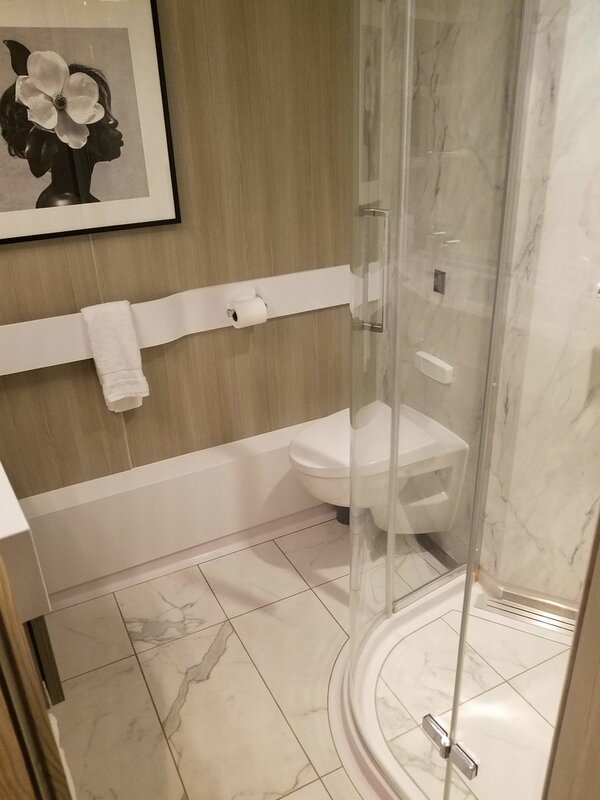 I actually think this would be an advantage for guests who are in a CS but who are mobility impaired, since there is no working bathroom in Luminae and the only other choice is an elevator ride to deck 14 or 15. 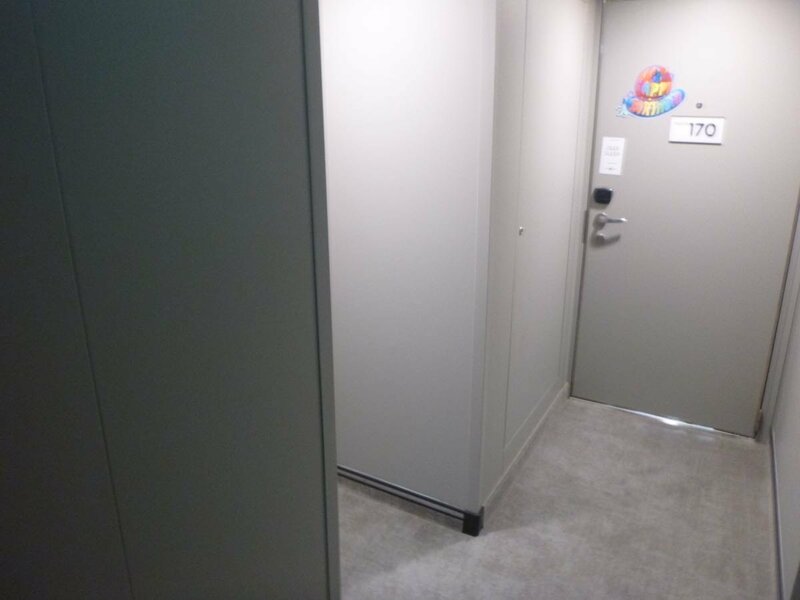 This suite is very convenient to the forward elevator bank as well. It is in a very quiet location. The WiFi signal and speed was excellent. Some concerns: We did not like the fact that we could not close and latch our balcony door when we were outside. The wind was constantly whistling through the door and it was kind of annoying. This might be something the CS shares with all other real balcony cabins on Edge. The view from the balcony looking forward is completely obstructed by the bridge and by the upper deck of the suite next door. Bath/shower leaked on the floor when taking a shower. Would You Book It Again? 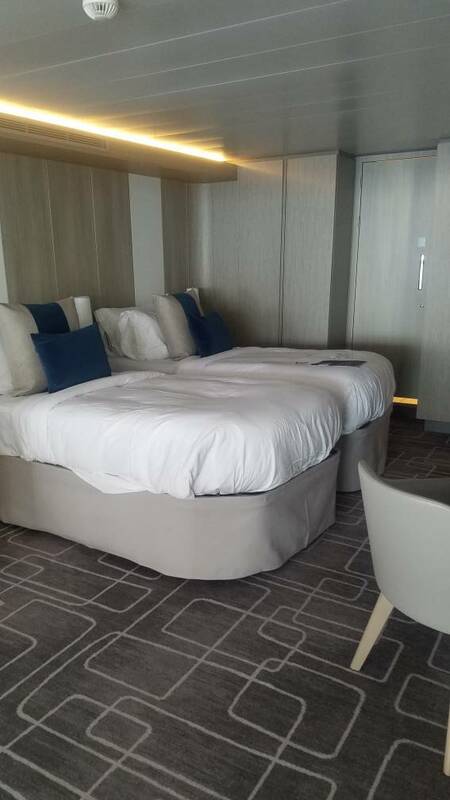 : We would not book this suite again because of the price and lack of loungers or footrests on the balcony. We would more likely book an aft S1 with a larger balcony which would be less expensive. Balcony/Window View/Obstruction: I wouldn't call it a balcony anymore, but the window and view were fine - when the window would actually go down. Balcony Overhang? : Not sure what this is, it was a pretty standard balcony. Connecting Cabin? Where Does it Connect? : These are "connecting" rooms. With HEAVY doors that CANNOT be locked open. So if you want to go to the other room, you have to pull the door in the room you are in, push the door in the room you are entering. EVERY time you go between rooms. My wife and I travel with 4 children under the age of 10 - I saw this as a safety hazard. Advantages/Problems/Comments: I will NEVER go on Edge again. And likely never go on Celebrity again. If you stayed in these cabins and had a raw sewage odor, PLEASE report it. They are telling my wife and I that we made it all up - nobody on the ship staff smelled it. 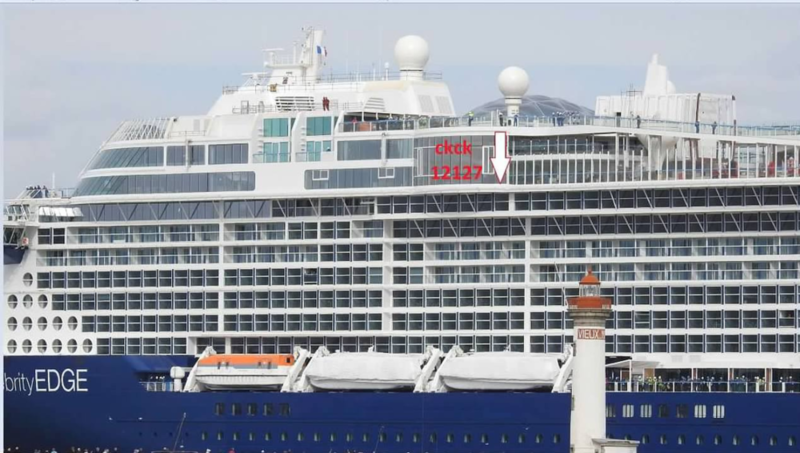 The 2 people who did leave it in the ships log described it as a "wet bathing suit" odor. Yet these people didn't every say that to us - "Hey, try moving your wet bathing suits somewhere else." Because of this, they will only offer an insulting future cruise credit because our complaints were "never verified" and "no cruises before or after yours filed a complaint." It was NOT from bathing suits. We have been on 9 cruises, 8 with Celebrity. This was a sewage odor. The staff on board were horrible in dealing with this issue in virtually every way. Post cruise support is almost worse. I won't even go into all our other issues with this ship. I would just say if you are thinking about it, don't. Would You Book It Again? : NEVER. Photos or Photo Links: Didn't take 1 picture of the room. Wasn't impressed and didn't want to be in the room any more than necessary. Balcony/Window Size: Small. Two small chairs and a table, which wasn't large enough to use as a coffee table for room service. 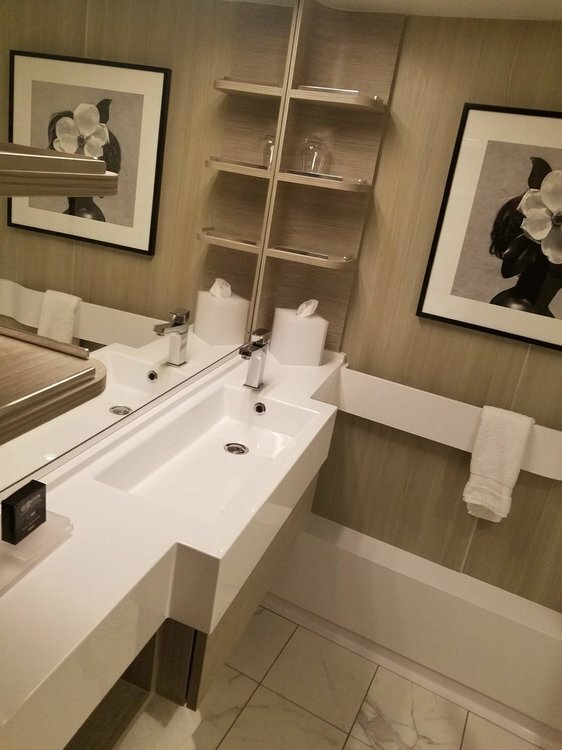 Suite Details: The dividing mirror over the sink was really cool in that it would let natural light in from the veranda. S1 afts do not have this feature. 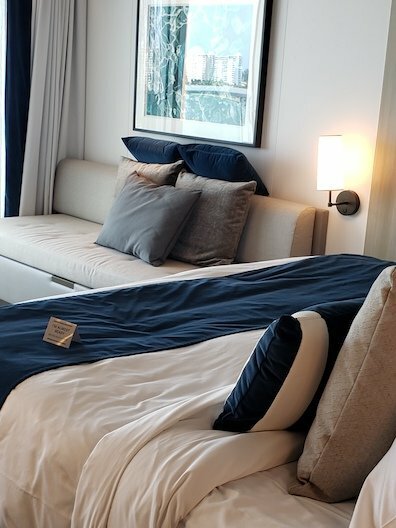 We liked the bed facing the veranda (S1 aft beds do not face the veranda, and they don't have the round window like Solstice class). There were three of us and on a 3-night cruise there was plenty of storage space. Bathroom size was impressive and thankfully a separate water closet. We had the rocking chair, which while esthetically pleasing was noisome when the trundle bed was pulled out. Photos or Photo Links: Sorry, none. General Comment: Cut the number of decorative throw pillows in half. Housekeeping should not have to spend extra time putting them away and rearranging them twice daily. Add to that if you move just one the effect is lost anyway. 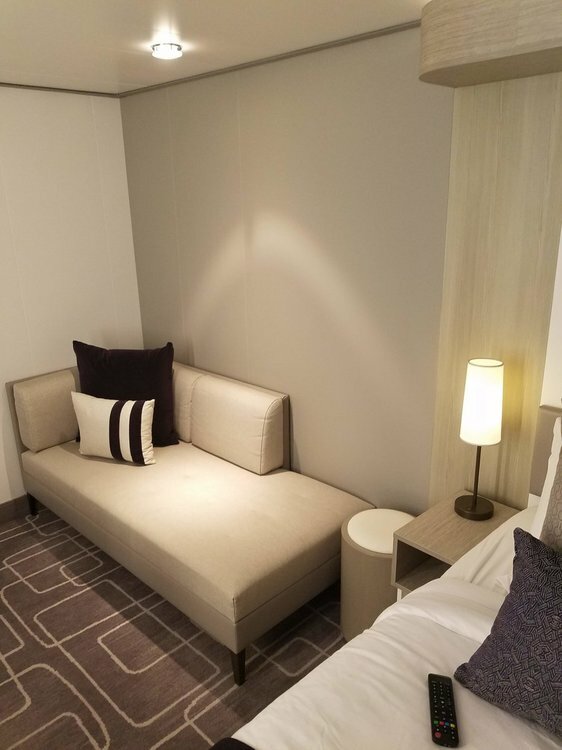 All the throw pillows are contrary to the clean lines of the cabin's design. Thanks to all who have contributed so far. We hit 50 cabins! 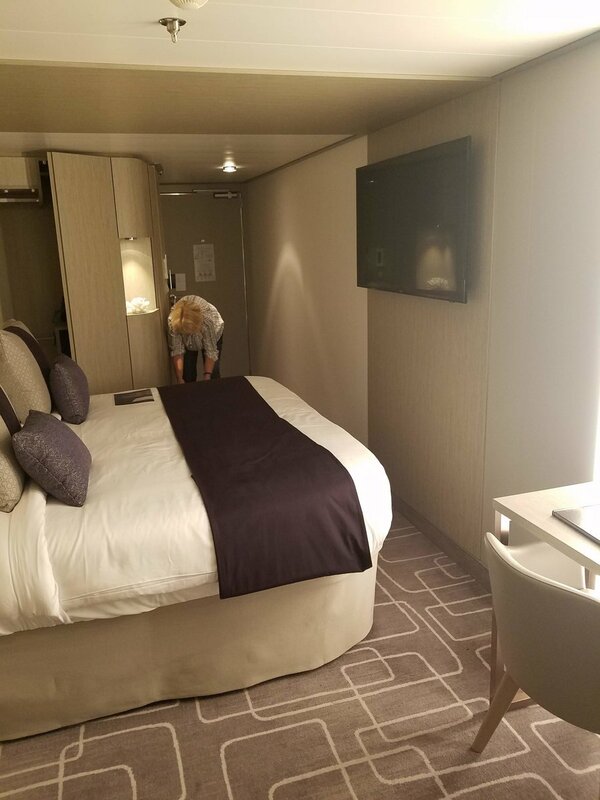 Hopefully, Celebrity Cruise Critic posters will continue to pay it forward by reviewing their cabins. It is helpful to have this reference when booking Edge cabins. 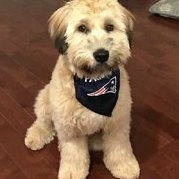 I just wanted to say a word about my role on this thread. It is a voluntary endeavor that I totally enjoy doing, but hope posters will humor my edits. Since this thread is about the cabins, I may not post all of the comments into the spreadsheet, if they are about the ship in general. The post link is at the end of each spreadsheet entry, so all comments are there for people to read in the post itself, just not in the cabin info spreadsheet (it would make it too unwieldy). I am trying to keep terms like "IV", "by the bath", "facing the ocean", "starboard aft", etc. the same so that when one searches the column, all of the same ones will line up - this means that I might edit something that someone posts. If I see something that I know to be incorrect, I will change it, such as a cabin that is said to be mid-ship and it is aft or the category is incorrect. I check all of the posts against the latest deck plans. I may add things that are blank, such as that a cabin is connecting, balcony size, etc. in an effort to give people as much info as is known about that cabin. Balcony Overhang? 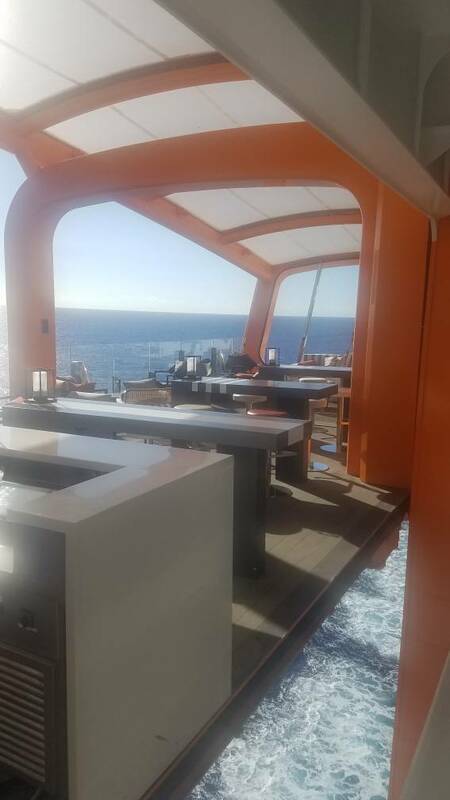 : A little as we were just one deck down from deck 12 which has the large overhang. Not a problem though. Noise Issues? : None at all. We could hear the people in the next cabins if both of our doors were open. Wind Issues? : No, if anything we had a little less wind because we were aft of the Magic Carpet track. 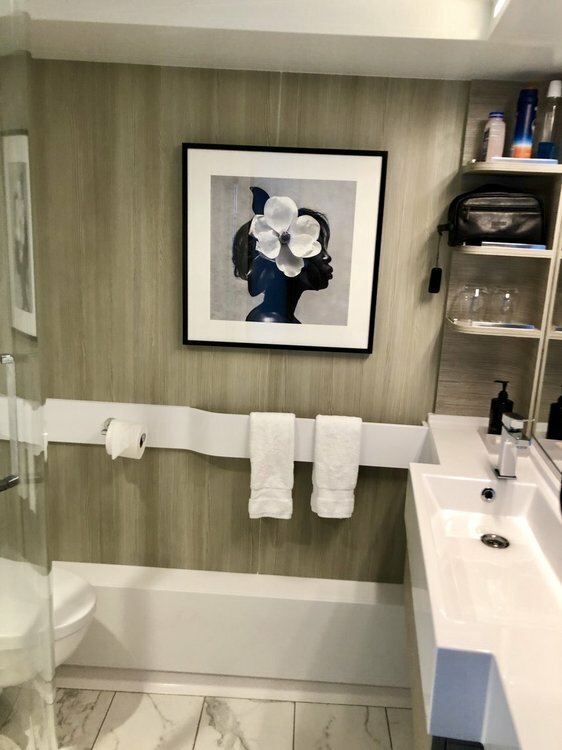 Suite Details: Sky Suite with a large bathroom. 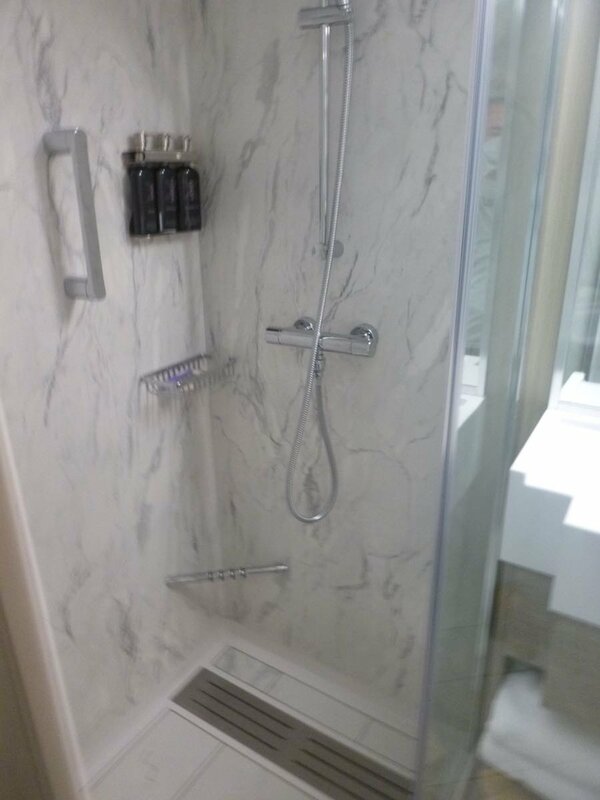 While we were on this trip they added a shower/tub door in addition to the shower curtain. However, it may need some modifications as it leaked a little. Advantages/Problems/Comments: The advantage was where it was. Very convenient. 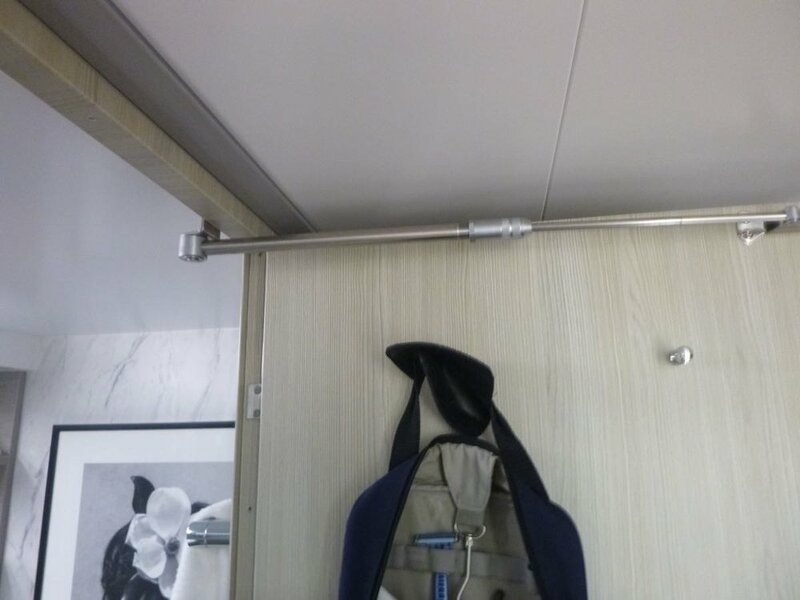 The only "problem" we had was that the bathroom door would make a bang when shutting it (very strong magnet, no way to hold it back). We ended up laying a washcloth over the top of the door and this helped with the noise. Due to the very mixed reviews of the infinite veranda and our love of the true balconies, we received this room on a move up offer. Very happy with our decision to bid! Would You Book It Again? : Absolutely!! 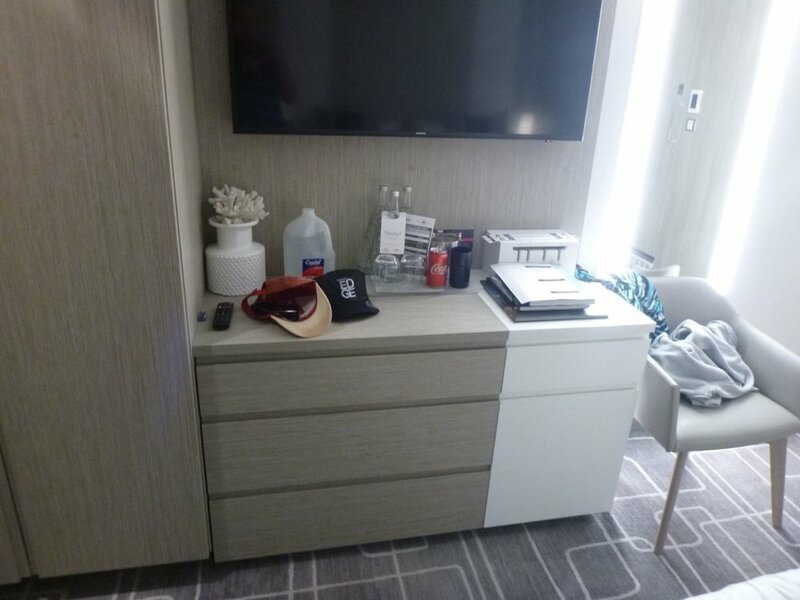 Suite Details: Gorgeous cabin. Huge bathroom. Really well laid out. Shower has a shower door. Advantages/Problems/Comments: Loved the bed facing the ocean. We actually used our balcony less than expected due to teh fabulous view from bed. Would You Book It Again? : Absolutely, but not at the current prices. Advantages/Problems/Comments: Nice size cabin, plenty of room and storage and felt really spacey. Would You Book It Again? 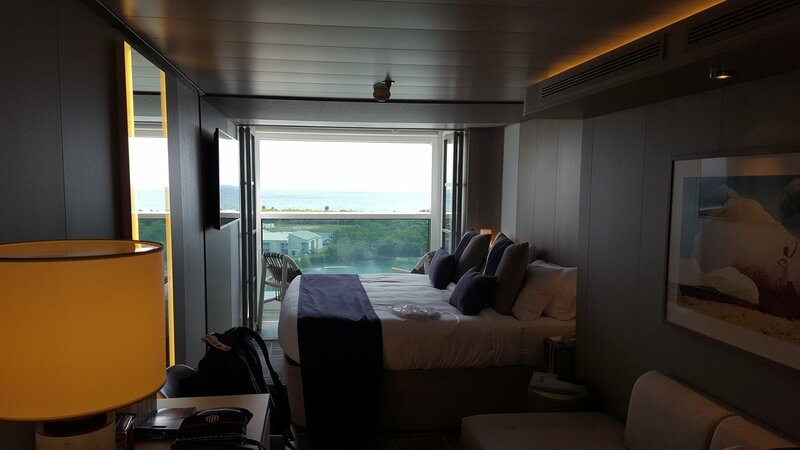 : Yes it was a nice inside cabing and superior to one I've stayed in the past, I typically do balcony room. One of the pics below of the safe shows it with my 10" Samsung Tablet in it to show the size and what might fit. I was surprised it fit and thought others might find this useful information. I didn't see this in the spreadsheet anywhere and was wondering if this list of obstructed cabins on Edge should be included somewhere in the spreadsheet. Thanks, it was a blast! Good idea to have a link to the obstructed cabins here! I also added it to the Edge Resources tab on the spreadsheet. Thank you! Noise Issues? : some ship noises during 8am to 10pm. clangs, rolling carts. room is obviously next to housekeeping areas. Advantages/Problems/Comments: very large for an inside room. Would You Book It Again? : got it free thru urcomped. very satisfied. Cabin Location: mid-ship, slightly forward. Bed Position: Facing the ocean. Balcony/Window View/Obstruction: Balcony, no obstruction, no support post. Noise Issues? : None. This was the quietest cabin we've ever been in. I never heard our neighbors. I believe being next to a firewall helped. 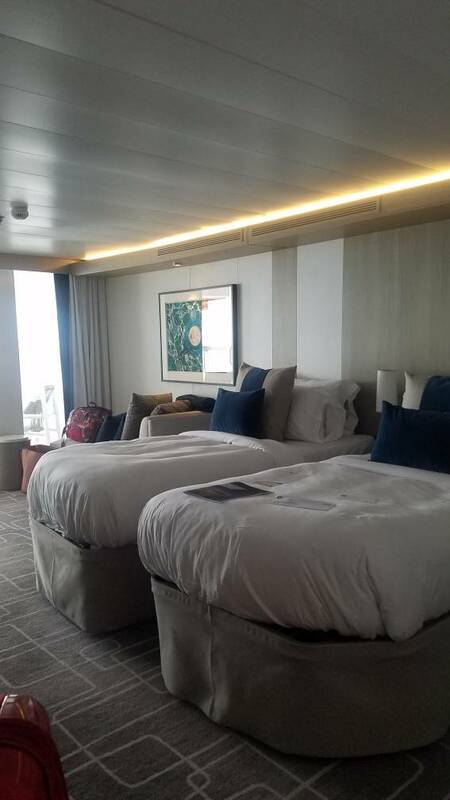 Suite Details: S2 with bed facing the ocean. 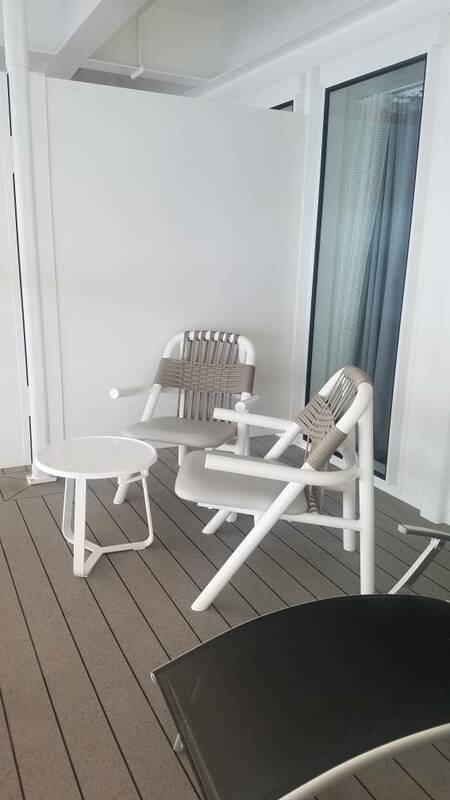 Regular chairs on balcony, no coffee table. Advantages/Problems/Comments: The suite was large and well designed with lots of storage. The location was great, as it was close to the elevators but not close enough to hear lots of traffic outside the cabin. 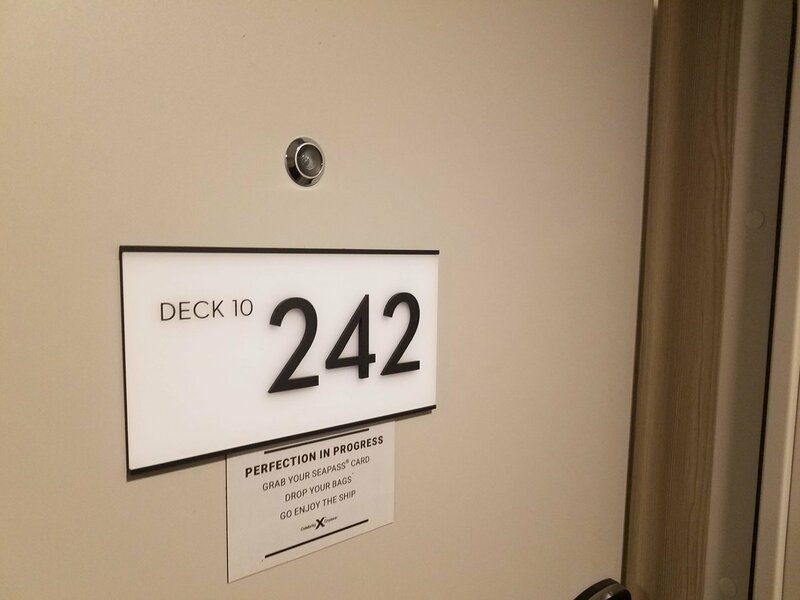 It was also close enough to the spa and Retreat decks. We did feel some motion of the ship, but this was an abnormally rocky sailing. The cabin itself was very quiet. Would You Book It Again? : Yes! 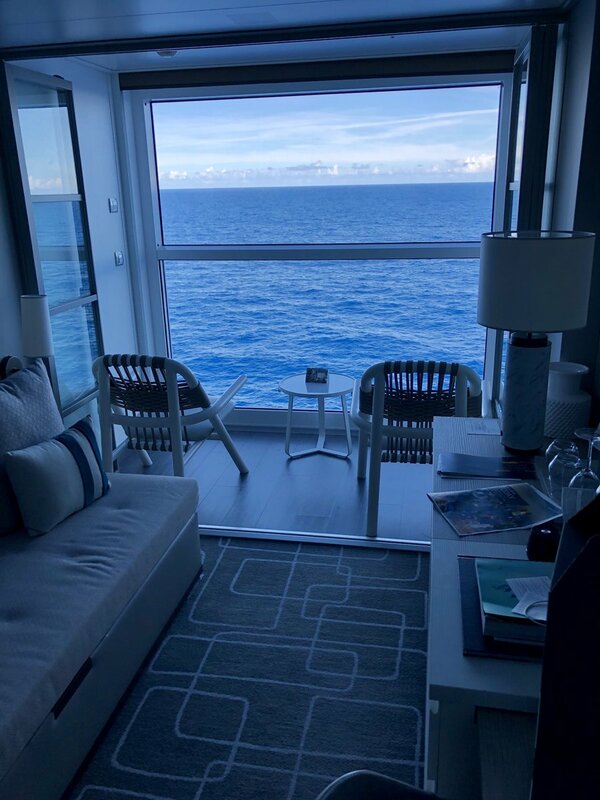 We have booked the exact same cabin on an upcoming Apex cruise. Would You Book It Again? : Not unless Celebrity was having a fantastic deal on both the Edge Class ships. We would book the IV only if the weather was going to be cooler. Photos or Photo Links: A mini review with photos at the below link.